Using modern genetic approaches, a team of researchers has provided strong support for the long-standing, but hotly debated, evolutionary theory of kin selection, which suggests that altruistic behavior occurs as a way to pass genes to the next generation. The researchers -- who include Christina Grozinger, distinguished professor of entomology, and David Galbraith, postdoctoral scholar in entomology, both at Penn State; David Queller, Spencer T. Olin Professor, Washington University in St. Louis; and others -- investigated kin selection by examining the social behavior of worker honey bees, which are all female. They found that the genes the workers inherit from their queen -- matrigenes --direct worker bees' altruistic behavior -- forgoing production of their own offspring to help rear their siblings. When the queen dies, the workers can begin to selfishly compete with one another to lay eggs. The genes they inherit from their different fathers -- patrigenes -- direct this behavior. "We usually think of honey bees as ideal cooperators, with all the members of the colony working together harmoniously," said Grozinger. "Our studies demonstrate that there is actually conflict -- called intragenomic conflict -- among the genes inherited from the father and those inherited from the mother." According to Grozinger, in a normal colony, the queen lays all the eggs and the workers remain sterile and help raise the queen's offspring. When the queen dies, the workers either behave altruistically by remaining sterile and helping rear the remaining offspring and the new offspring of their sisters or they behave selfishly by activating their own ovaries and laying their own unfertilized eggs, which develop into males. "In 2003, David Queller published a key model using kin selection theory that predicted that under queenless conditions in a honey bee colony, the patrigenes would promote selfish behavior in the workers, while the matrigenes would promote altruistic behavior," said Galbraith. According to Queller, this conflict is the result of unequal distribution of the matrigenes and patrigenes among the workers. All the workers in the colony share the same set of matrigenes. 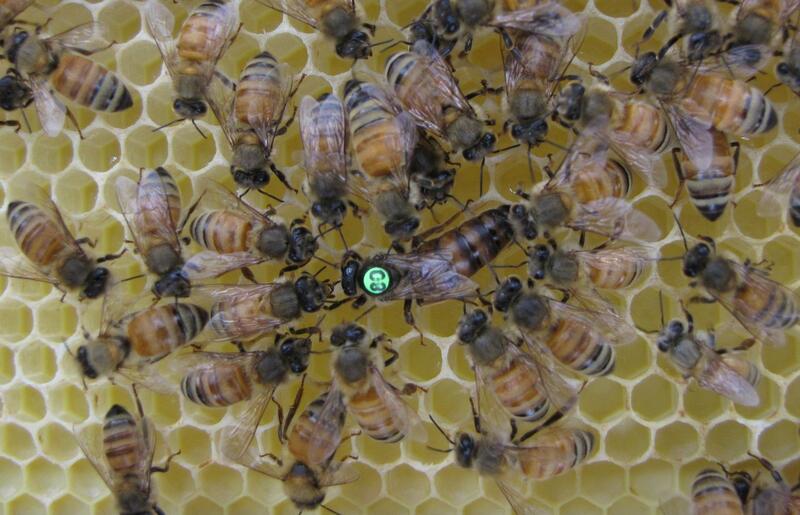 In contrast, because the queen mated with 10 or more males, the workers have different patrigenes. If a worker behaves altruistically and helps rear her sisters' offspring, she ensures that her matrigenes are passed on. However, more of her patrigenes pass to the next generation if she behaves selfishly and lays her own eggs. "It is very strange to think that your genes might be fighting with each other based on whether they came from your mother or your father," said Queller. "Yet, this is just what we found. It turns out that when a queen dies, worker bees behave the way their fathers want them to, producing sons when possible." The results appear today (Jan. 11) the Proceedings of the National Academy of Sciences. According to Queller, this intragenomic conflict supports the theory of kin selection first proposed by William Hamilton in 1964. Altruism is defined as reducing one's own reproductive output to help others reproduce. So kin selection theory predicts that altruism will only evolve to help related individuals. Using kin selection theory, David Haig, professor, Harvard University, developed models predicting intragenomic conflict, which Queller then extended to social insect societies. In 2010, however, biologist E.O. Wilson and colleagues published a paper that argued kin selection is not needed for altruistic behavior to evolve. "While Queller's model made very specific predictions about the behavior of matrigenes and patrigenes in social insects, it was not possible to test this prediction until modern genomic tools were developed that allowed us to specifically track both matrigenes and patrigenes in the same individual," said Grozinger. The researchers created 18 different male-female crosses of two different genetic stocks of honey bees -- Africanized bees, which produce larger ovaries, and European bees, which produce smaller ovaries. The crosses enabled the workers to determine which of the genes -- those from fathers versus those from mothers -- were active in the offspring. 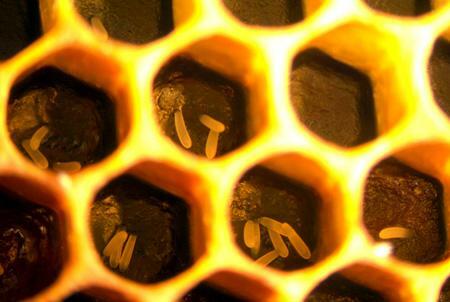 The team housed the worker bee offspring without a queen, stimulating some to start producing eggs. The researchers first demonstrated that worker bees with Africanized fathers and European mothers had larger ovaries and were more likely to become reproductively active than bees with European fathers and Africanized mothers. According to Grozinger, this demonstrated that the reproductive traits of the workers were more strongly influenced by their patrigenes than matrigenes. "We identified more than 100,000 sections of DNA, called single nucleotide polymorphisms, that were present in the genomes of either the mother or the father, but not both," said Galbraith. "This exercise enabled us to determine which pieces of RNA in their worker offspring were produced by the matrigenes versus patrigenes." Next, the researchers harvested workers bees' ovaries and sequenced the entire set of RNA molecules to see which of their inherited genes were expressed to a greater extent. "We found that expression of the patrigenes, but not matrigenes, was strongly associated with worker egg-laying behavior," Galbraith said. According to researchers, they next plan to explore intergenomic conflict in other systems. "What is amazing about Queller's model is that it provides very detailed predictions for how matrigenes and patrigenes behave in different social insect species and different contexts -- in some cases, matrigenes are the selfish ones," Grozinger said.